The perfect way to get your daily dose of potassium! Are you working on ways to make sure that your heart stays in the best condition possible? If you're looking to maintain healthy blood pressure then you need to feast upon as many potassium rich foods as possible and one of the most potassium filled foods happens to be...*drum roll, please*...bananas! If you're not in the habit of eating a banana everyday for breakfast, then we know a fun and easy way to crave the scrumptious bright yellow fruit. 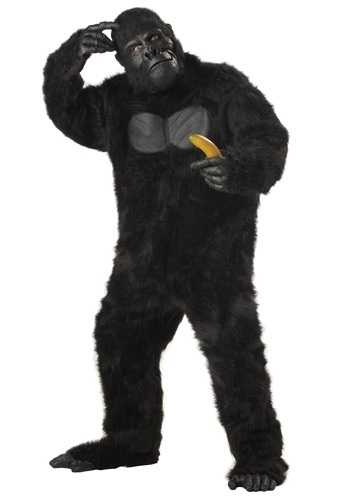 Wake up every morning and jump into this plus size realistic gorilla suit. This costume will make you want to gobble down a banana as soon as you get out of bed. You'll receive a faux fur jumpsuit with a molded chest piece and a tie that fastens at the back of the neck. The included mask is a fur hood which covers the entire head and also features a vinyl face. Finally, put on the gloves and shoe covers and you'll be ready to turn on your monkey mode. You'll be jumping all over the house, yelling, ""ooh-ee-ahh-ahh-ahh!" Then, you'll suddenly get the urge to dart into the kitchen and peel yourself a yummy banana. You'll be gobbling down so many bananas all of a sudden that your heart will be pumping great and your blood pressure will be perfectly balanced. We didn't think that obtaining a monkey suit would make us a healthier person, but it really did the trick! You'll have fun monkeying around while wearing this realistic looking costume!